You are here: Home / 2010 / November / Need a BBC Radio iPhone app? Get TuneIn Radio. The app works over wifi and 3G. It doesn’t really do very well on GPRS. And how does it work with the Beeb? Pretty much all the radio stations are there, including the World Service. Browse –> Enter “BBC” as the search term –> Then you can choose BBC, BBC TV, BBC Local Radio, BBC Nations Radio (Radio Cymru, Ulster, etc. ), and a list of stations. Alternatively, once you’ve chosen a BBC station and are listening to it, click “Options” near the bottom right, then “You may also like…”. This will give you a selection of similar stations, but below those is “Networks” and “BBC”. Click on this and you’ll get more listings. In case you’re wondering, BBC TV is the audio of BBC Parliament, and BBC Arabic and BBC Persian TV. 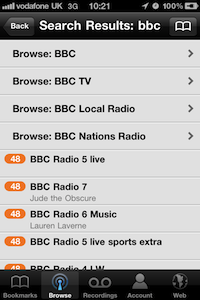 And yes, sports fans, you can get Radio 5 Live. Also: both LW and FM versions of Radio 4. If you want to check out which stations are available before you buy the app, you can look through the directory at RadioTime. Again, if you’re listening to a station, click on Options –> View Schedule. You’ll get the schedule for that station. Say I’m listening to Radio 6, I’ll do the above, pick “Steve Lamacq”, and get the previously broadcast shows currently available through iPlayer. Excellent! (You can also just search for say “Steve Lamacq” using the browse funtion, and it’ll give you his iPlayer-available shows. Most BBC stations stream as 48kbps WMA, and it’s very listenable. It’s not CD-quality, but sounds pretty good with my iPhone docked in my Logitech speakers. There are some differences: BBC Mundo streams at 96, BBC Chinese and Persian at 32, and BBC Parliament at 256. You’ll need to be in the UK to access iPlayer content. However, if you’re not then you can get around this by connecting to a VPN service that gives you a UK IP address. The odd BBC radio station isn’t available, for example, BBC Radio Orkney. I also wish I could bookmark the BBC network, so that I don’t have to trawl through the app to find the stations everytime. You can’t save your recordings. If you have a jailbroken iPhone, you used to be able to navigate to to app’s Documents folder, pull off the big files to your computer, rename as *.mp3, and that would be it. The developer has now implemented some file splitting, which only makes it readable by the app. Free isn’t always best; I’m happy to pay for polish. And this is one polished app. The way in which you navigate BBC content could be improved a bit, but overall – recommended. Also: the iPad version is dropping any day now! Next Entry: Are some MobileMe services to go free?